A guy directing traffic made an exception for me to drive by to capture this video from the top of the hill and headed down to the highway. The video is shot with my DOD Tech DOD-LS470W dash cam. It hangs under my rearview mirror with an AmorTek SnakeMount, a cool accessory that will fit just about any camera out there. Here are other stories I’ve done about flags. Beautiful picture of the Flags, thanks. 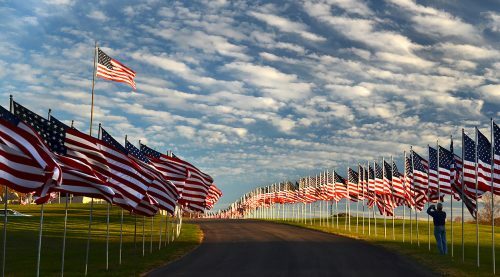 I try to always make this drive when the flags are flying . . . . on my motorcycle if possible. It lifts my spirits and fills my heart in a special way that not many other experiences do. I had a wonderful Veteran’s Day attending two different ceremonies with friends and fellow vets. Got some great “free food”, took a long walk with dog Olivia, and smoked a fine, cheap, celebratory cigar. Unfortunately, I did not get to make my visit to County Park North to drive through the flags. So thank you for posting this unique and very special video. It made my day! Thanks, Ken. That display is one of the many things that makes me proud that I am from Cape Girardeau. Do you happen to know how many flags were present? Video very moving and beautiful. I love seeing those flags waving in the wind on holidays. Also enjoyed the other flag memorials, especially the one of Bobby Taylor. God bless all of our military, police officers and fire fighters. Thank you for your contributions to the tiger newsletter which are so interesting, informative and all of the beautiful pictures you share with us. Previous PostPrevious Hey, What’s that Sound?